The 4-sided Peace Pole bears the Peace Message, May Peace Prevail On Earth in Japanese, English, Spanish, and Hawaiian. 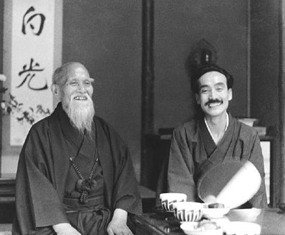 Mitsuteru Ueshiba, great-grandson of Morihei Ueshiba, Founder of Aikido, is a life long member of The World Peace Prayer Society. He recently visited the Aikido of Hilo Dojo and took part in the Peace Pole Dedication Ceremony. He read aloud the Peace Message, May Peace Prevail On Earth, in Japanese for all of us. Masahisa Goi Author of the Universal Peace Message and Prayer, May Peace Prevail on Earth, and Founder of the World Peace Prayer Society was a close acquaintance of Morihei Ueshiba, Founder of Aikido. Here they are together enjoying an afternoon in Mr. Goi’s home in Ichikawa, Japan.